Not to be confused with the contemporaneous Republic of the Rio Grande in Mexico. The Riograndense Republic, often called Piratini Republic (Portuguese: República Rio-Grandense, literally "Great River Republic", or República do Piratini), was a de facto state that seceded from the Empire of Brazil roughly coinciding with the present state of Rio Grande do Sul. It was proclaimed on September 11, 1836, by General Antônio de Sousa Neto, as a direct consequence of the victory obtained by Gaúcho oligarchic forces at the Battle of Seival (1836), during the Farroupilha Revolution (1835–1845). It had a constitution finished in 1843 and was recognised only by Britain, France, and Uruguay. Proclamation of the Piratini Republic. Antônio Parreiras. The official flag of the Riograndense Republic was composed of green, yellow and red colors. There are two versions for the motif of the composition of the flag: one version explains that the colors-symbols of Brazil, yellow-green and red, symbolize the republic, intersecting them; Another version explains that the green represented the forest of the pampas, the red the revolutionary ideal, and the yellow the riches of the gaucho territory; And another version says to be the green of the Portuguese flag and the yellow of the Spanish flag (respectively, the most important colonizer and the second most important colonizer of the territory of the state of Rio Grande do Sul), interspersed by the vertical red stripe that Would be symbol of federation in the platine region from the time of Jose Gervasio Artigas (1764-1850). However, green would only be added to the Portuguese flag in 1910, 65 years after the end of the Farroupilha Revolution, which discards this latest version. Likewise, the current flag of the state of Rio Grande do Sul comes to have the same colors, having been added the coat of arms of the Riograndense Republic in the middle of the flag. In 1839, the Riograndense Republic formed a confederation with the short-lived Juliana Republic (República Juliana in Portuguese) which proclaimed its independence in the same year. November 1839, however, saw the war result in the defeat and disappearance of the Juliana Republic. The Riograndense Republic had five capitals during its nearly nine years of existence: the cities of Piratini (for which it is often called Piratini Republic), Alegrete, Caçapava do Sul (official capitals), Bagé (for only two weeks), and São Borja. The war between the Gaúchos and the Brazilian Empire was ended by the Ponche Verde Treaty. The economy of the then Province of São Pedro of Rio Grande do Sul of the Empire of Brazil was mainly focused on the production of jerky and leather. The province returned its production to the domestic market, on which it depended entirely. But with the overvalued exchange rate and the tariff benefits then offered, the imported beef had a lower cost than the national one. Thus, the estancieiros of the region, among then the famous Bento Gonçalves, began a rebellion against the Imperial Government. After a meeting, it was decided that armed militias would be formed inside the province to take over the government under Bento's leadership. At first the objective was to take over the province's government, which was successfully done, and enter into negotiations with the imperial government of the regent Diogo Antônio Feijó to explain the reason for the rebellion with the requirement that a new government be appointed to the province that would please the regional elite. Meanwhile, the new appointed President of the Province was completely rejected, but took office. His possession was seen by the landowners as a disrespect and a declaration of war, gathering his soldiers who had been scattered since October. Then the new President of the Province, Araújo Ribeiro, began a hunt for ragamuffins, gathered his army, ordered the Provincial Assembly to be closed and Bento Gonçalves was removed from the command of the National Guard. In Rio de Janeiro the imperial government banned the use of the Porto Alegre customs as long as the city was in the hands of the rebels, restricting the arrival of ships. With the overwhelming victory of the rebels, led by Antônio de Sousa Neto, the separatist idea took shape. At night ideological questions were revised and Lucas de Oliveira and Joaquim Pedro, ardent republicans, catechized Neto, arguing that there was no other way out but to embark on the path of independence and that there was no other popular desire but desire of freedom, of abolition of slavery and of democracy under the republican system. Neto came to sympathize with the idea, but resisted before a probable disapproval of his peers. He thought that such a proclamation of a new Republic should start from Bento Gonçalves, the great commander of all rags. They contended that Bento had already decided on the republic, that "rigid hierarchy was a thing of the empire, and that the republican system was centered on the people, their wants and needs, and not on the governing elite". Finally, by acquiescing to Colonel Neto, they began to write the Proclamation of the Riograndense Republic that would be read and carried out by him, before the profiled troops, on 11 September 1836. Bento Gonçalves would be informed and acclaimed president, later. Antônio de Souza Neto proclaimed the Riograndense Republic. Brave comrades of the 1st Cavalry Brigade! Yesterday you obtained the most complete triumph over the slaves of the Court of Rio de Janeiro, which, envious of the local advantages of our province, makes mercilessly pour the blood of our compatriots, in order to make her prey to her ambitious sights. Miserable! Whenever their satellites have appeared before the free forces, they have succumbed, without this fatal disappointment making them give up their infernal plans. There are countless injustices made by the Government. His despotism is the most atrocious. And will we suffer so much shame? No, our comrades, the Rio Grande, are willing, like us, not to suffer for the longer time the arrogance of a tyrannical, arbitrary, and cruel government like the present. In every corner of the province there is no other echo than that of independence, republic, freedom or death. This echo, majestic, which they constantly repeat, as a part of this soil of free men, makes me declare that we proclaim our provincial independence, for which our work for liberty and the triumph we obtain yesterday, on these miserable slaves of absolute power. Comrades! We who are the 1st Brigade of the Liberal Army, must be the first to proclaim, as we proclaim, the independence of this province, which is disconnected from the rest of the Empire, and forms a free and independent state, with the title Riograndense Republic, and whose manifesto to the civilized nations will be done competently. Comrades! Let's shout for the first time: Long live the Riograndense Republic! Long live the independence! Long live the Republican Army of Rio Grande! Campo dos Menezes, 11 September 1836 - Antônio de Sousa Neto, colonel-commander of the 1st brigade. The other Brazilian provinces were called to unite as federated entities in the republican system, a national anthem and flag of the new state was created, until now cultivated by the State of Rio Grande do Sul. The capital was also established in the small city of Piratini, from which came a new nickname, the Republic of Piratini. From this moment on, the immediate end of the Ragammuffin Revolution occurred and the Ragamuffin War began. Flag of the Juliana Republic. As the war progressed with successive ragamuffin victories, the Riograndense Navy led by the Italian revolutionary Giuseppe Garibaldi and the gaucho David Canabarro advanced to the Province of Santa Catarina to attack the city of Laguna. Laguna was taken, with the help of the Laguna people themselves, on 22 July 1839. On 29 July the Juliana Republic was proclaimed an independent country, linked to the Riograndense Republic by ties of confederalism, and David Canabarro became its first President. With the capture of Laguna, half of the imperial province was in the hands of the republican separatists, however the rampage was contained by entrenched imperial troops. Shortly afterwards the empire reacted with full force, destroying the Riograndense Navy and advancing rapidly on the rebels in Santa Catarina. The retake of Laguna on 1 November 1839 put an end to the Juliana republic and its confederation with the Riograndense Republic and the province was retaken to the Empire. The Riograndense Republic was dissolved on 1 March 1845, by the Ponche Verde Treaty, which maintained in force some laws derived from the Rio Grande Republican Constitution. Until the year 1840, one could perceive a period of ascent ragamuffin, with several victories in the military field. After this period, a situation of decay, beginning with the fall of Laguna, is perceptible. With the Imperials controlling the great cities, the rags were retained in the interior, and soon internal quarrels began. The declaration of the Duke of Caxias announced the end of the Ragamuffin War, in 1845. Bento Gonçalves, still in the year 1840, due to the failures, waved to the empire with the possibility of agreement. Bento asked the imperials for safeguards so that his comrades could cross with impunity the places conquered by the empire, in order to settle with the imperial chiefs the details of a collective surrender of the ragamuffin rebels. They actually carried a letter of this design. But there was another oral message to be given to those leaders, which could not be written. The maneuver, however, was so well thought out and executed that it would fool even his fellow combatants, and motivated a letter of disapproval written by Domingos José de Almeida, then Vice-President and Minister of Finance of the Riograndense Republic. The fighting continued on several fronts. Meanwhile, a Constituent Assembly had been called on 10 February 1840, but maneuvers of Bento Gonçalves, who did not want to lose power, led to the promulgation only in 1842 of the Constitution of the Republic. Facing internal conflicts, economic and military problems against the forces of the Empire, the Republic was forced to start the peace negotiations. In 1844, Fructuoso Rivera proposed to broker peace between legalists and republicans. Manuel Luís Osório was sent to the camp of Rivera, where he met with Antônio Vicente da Fontoura, to inform that the Duke of Caxias, leader of the imperial forces, rejected the proposal of peace, but that there could be negotiations with the government, but without the presence of third parties. Vicente da Fontoura was sent to court to discuss peace. Caxias received instruction from the empire, which feared the advance of Rosas on the litigating territory, to propose honorable conditions to the rebels, such as the amnesty of officers and men, their incorporation to the Imperial Brazilian Army in the same positions and the election of the President of the Province by the Provincial Assembly, taxes on the imported meat from the Platine region. However, one question remained unanswerable, that of slaves freed by the Republic to serve in the Republican army. For the Empire of Brazil, it was unacceptable to recognize the freedom of slaves given by a sedition, although it did annihilate the leaders of the same revolt. Finally, on 1 March 1845, peace was signed: the Ponche Verde Treaty, after almost ten years of war. Among its main conditions were the amnesty full to the rebels, the liberation of the slaves who fought in the Republican Army and the election of a new provincial president by the ragamuffins. Partial or full compliance with the treaty to date raises discussions. The impossibility of a regionally restricted abolition of slavery, persistence of animosity between local leaders and other administrative and operational factors may have at least hindered, if not prevented full compliance with it. Such discussion is referred to the main article of this subject. The Riograndense Republic was reattached to the Brazilian Empire. Bento Gonçalves, first President of the Riograndense Republic. 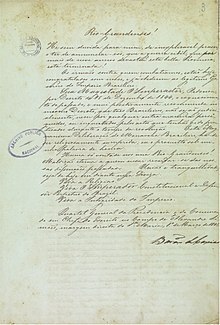 The Constitution of the Riograndense Republic was completed in 1843, after seven years of independence from the Brazilian Empire. It was signed, "by the very fist of all the deputies" in Alegrete (when it was still a town), on 8 February 1843. The document includes the names of José Pinheiro de Uchôa Cintra, Francisco de Sá Brito, José Mariano de Matos, Serafim dos Anjos France, Domingos José de Almeida. Among its articles was written: Detached the Riograndense people of the Brazilian communion, resumes all the rights of primitive freedom, makes use of these imprescriptible rights constituting an independent Republic, takes in the extensive scale of the sovereign states the place that is responsible for the sufficiency of their resources, civilization and natural riches that assure you the full and complete exercise of your independence, eminent sovereignty and dominion, without objection to the sacrifice of the smallest part of this same independence or sovereignty to another nation, government or any strange power. This legacy of ragamuffin, came to be considered as the legitimate cradle of Brazilian Republican law. Garibaldi leading the Riograndense navy to Laguna. The Imperial Brazilian Navy controlled the main communications media of the province, the Patos Lagoon, between Porto Alegre, Pelotas and Rio Grande, and most of the navigable rivers. In spite of this, it was constantly attacked by ragamuffins, when near the ravines of the rivers. On 1 February 1838, a troop of two thousand rags and a battery of artillery were able to attack two gunboats and a barge on the Caí River, killing almost all the sailors, imprisoning one of the commanders and capturing their ships, thus beginning the creation of the Riograndense Navy. In 1838 Giuseppe Garibaldi had known Bento Gonçalves still in his prison, in Rio de Janeiro, and gave him a corso letter to imprison imperial ships. On 1 September 1838, Garibaldi was appointed captain-lieutenant, commander of the Riograndense navy. A shipyard was set up next to a weapons and ammunition factory in Camaquã, at the resort of Ana Gonçalves, sister of Bento Gonçalves. There Garibaldi coordinated the construction and armament of two war-craft. At the same time, Luigi Rossetti went to Montevideo, seeking the help of Luigi Carniglia and other indispensable professionals. After a few weeks, the equipment of masters and workers was complete. Some sailors came from Montevideo and others were recruited around. After the construction of the boats and launched into the water, they captured some merchant ships, but there was not much success against the powerful imperial navy. The Riograndense Navy was completely destroyed in 1839 after their defeat in Santa Catarina. The United Provinces of Rio de la Plata at the time were being unified by the dictator Juan Manuel de Rosas and tried to recover the Uruguayan territory (Platine War), not excluding also the possibility of aid to the Riograndense separatists. Juan Manuel de Rosas, the Argentine dictator, offered support so that David Canabarro continued the fight. Juan Manuel de Rosas was removed from power in Argentina in a confrontation involving Brazilian troops. Alongside the de facto recognition by the Argentine Confederation, Uruguay started to recognize the independence and sovereignty of the Riograndense Republic, but the diplomatic process was not completed. The United Kingdom and France recognised the new republic under the condition that its port would be open to French and British ships. Alegoria Farroupilha, Museu Júlio de Castilhos archive, Porto Alegre. The parishes of Rio Grande do Sul were linked to the bishopric of Rio de Janeiro, which brought several obstacles to the Riograndense Republic. To break with the Empire of Brazil, the farroupilhas separated completely from the court. On 22 June 1838, they named Father Chagas as apostolic vicar, denying obedience to the bishop of Rio de Janeiro, creating a schism in the Catholic Church of the then Province of St. Peter of Rio Grande do Sul. The apostolic vicar had true religious authority: and appointed priests and dispensed marriages. Father Chagas was excommunicated and his acts were declared unlawful by the bishop of Rio de Janeiro - the maximum authority of the Catholic Church in Brazil. Likewise, most of the Gaucho clergy adhered to the new ecclesiastical authority. Assim mesmo, a maior parte do clero gaúcho aderiu à nova autoridade eclesiástica. The situation lasted until the end of the Ragamuffin Revolution (1835–45). With the defeat, the priest Chagas sought a reconciliation with the bishop of Rio de Janeiro, having been secretary of the new bishop of Porto Alegre. After the end of the revolution, Father Fidêncio José Ortiz was entrusted by the bishop of Rio de Janeiro to review all the acts practiced and other documents. The Riograndense Republic is symbolically perennial in the flag and coat of arms of the state of Rio Grande do Sul, just as other Brazilian states maintained in their civic symbols evocations of relevant deeds. Its territory derived from the partial split of the Province of São Pedro do Rio Grande do Sul, which had its limits totally defined in relation to Uruguay only after the end of the Ragamuffin War (1835–45). After the proclamation of the Brazilian Republic (1889), the whole territory of the Province became one of the federal units of Brazil, the state of Rio Grande do Sul. It does not hold the monopoly of force, since it no longer has its own army: it hosts the Southern Military Command of the Imperial Brazilian Army. Its administration is not independent of the Imperial Government, within the Brazilian unitary state, nor was there any subsequent nomination or election of another national president of this Republic other than Bento Gonçalves and Gomes Jardim. Finally, the inhabitants of the territory declare themselves Brazilian and participate in Brazilian political life; thus lacking the third fundamental element for the legitimate existence of any national State. ^ "Constitution of the Rio-Grandense Republic (dated 1843)". pampalivre.info. Retrieved 1 September 2012. ^ a b c SPALDING, Walter (1956). Enciclopédia Rio-grandense. .
^ Trevelyan, George Macaulay (1907-01-01). Garibaldi's defence of the Roman Republic. London, New York [etc.] : Longmans, Green and Co.
^ a b Rio Grande do Sul, Assembleia Legislativa (1998). Assembleia Legislativa do Estado do RS (ed.). "Estados Unidos e Rio Grande - Negócios no Século XIX - Despachos dos Cônsules Norte-Americanos no Rio Grande do Sul 1829/1941". ^ AHIMTB (ed.). D Canabarro. .
^ EdiPUCRS, ed. (1994). História da Igreja no Rio Grande do Sul. p. 181.
http://www.brazil.org.uk/events/machadodeassis_assets/openingaddressvilaca.pdf[dead link] – Opening address of Dr Marcos Vinicius Vilaça, President of the Brazilian Academy of Letters.